Steel, hardware, tape, charcoal on paper. 20’x9.’ 2016. Anthrokinegraph is a word invented to describe the mark made by a human body in action. 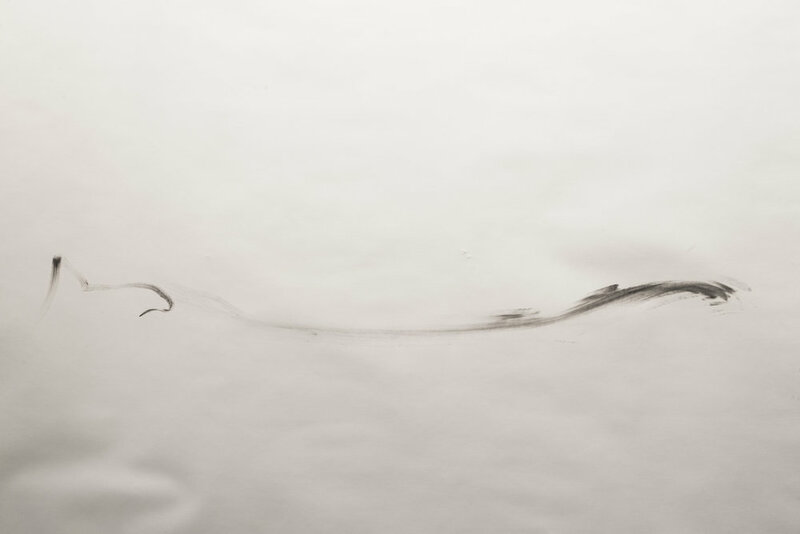 Anthrokinegraph III is a drawing of the body, how the physical circumstances of a drawing define the result. 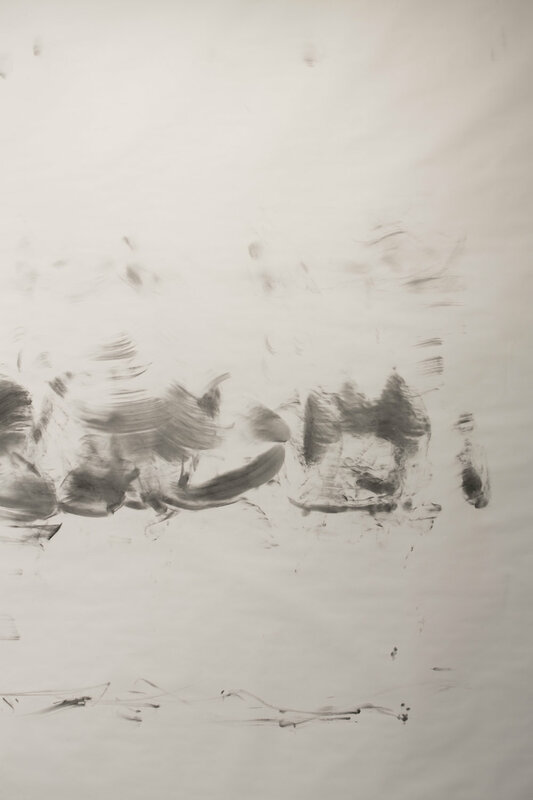 For this piece, a nine-foot by twenty-foot sheet of paper is hung on the wall of the gallery. A two-inch flat metal ledge is mounted along the upper edge of the full length of paper. To make the drawing, I coated myself with charcoal, then traversed the metal ledge the length of the paper, hanging by my fingers. As I inched and swung along the wall, my motion is recorded on the paper in dark smudges as a drawing. The physical challenge of making Anthrokinegraph III demands acute physical awareness in the moment and causes the mark making to be experiential and kinesthetic, escaping analysis until the action is complete. The action is not a defiance of gravity; it is an illustration of its incredible force, the futility and necessity of our struggle to live with it. Through the body, we collectively understand this struggle. 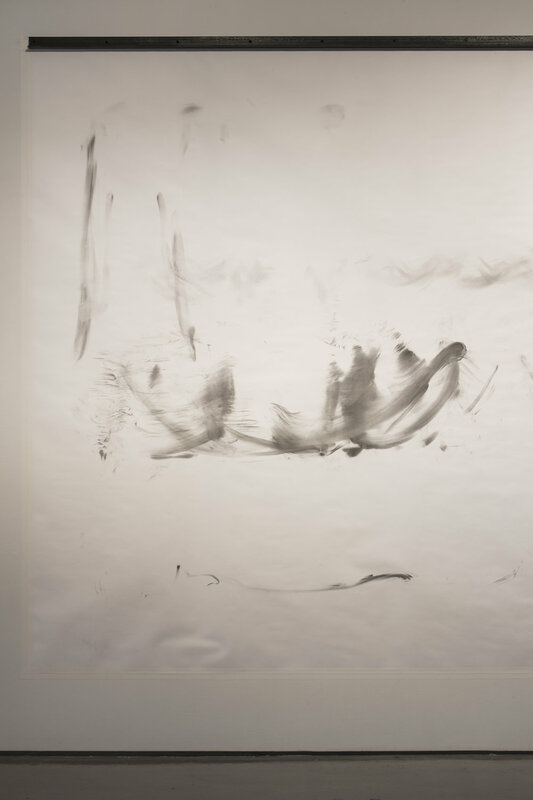 The wispy dark marks of the drawing itself disguise the physical exertion. They hang, light and airy on the wall, resembling something cloudlike, a drawing of mist or smoke. The observer’s ability to recognize the action determines the read of this piece. Aware of the physicality, the work is an action of struggle, but unaware, the drawing represents a floating feeling, as if gravity did not exist at all.